[Blind Gossip] Did you catch the sort-of-live broadcast of the musical Rent on TV last night? We say sort-of-live because the lead actor unfortunately sustained a serious injury (either a broken foot or a broken ankle) a day or so before the live broadcast, so they basically wound up broadcasting a tape of the dress rehearsal instead. Anyway, here’s an interesting bit about two of the stars of the show. They hooked up during production. They weren’t exactly subtle about it. Lots of tongues and hands backstage. No, they weren’t rehearsing! We do not know yet if their fling will last beyond the production. [Optional] Best/worst part of the production? Good lord, Rent live was terrible. I did watch most of the live-ish production. I think they could have found a way to keep the live show even with Brennin in a wheelchair. But overall it was ok. Vanessa did a great job and Valentina (known to me from Drag Race) was good too. Not familiar with the rest, but Jordan Fisher kept givng me stage face, like he did on DWTS. No clue of the hookup is. It was bad…Changed the channel. Not sure but getting a 2 ladies vibe here with “lots of tongues and hands backstage” clue. 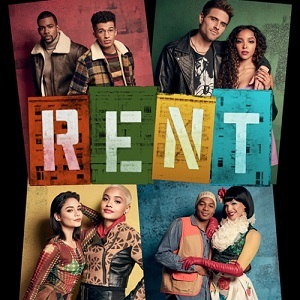 I semi-watched Rent but found it way too busy a production and it dated itself with all eighties & early nineties AIDS/ HIV references. It’s literally a show about how young people in the early 1990s struggled with the AIDS epidemic at a time when diagnosis was still a death sentence for all but the ultra-wealthy. I’m not sure how it could have been edited to remove those references without diluting the entire message of the show. We’re really at a point where it needs to be viewed more as a period piece of the 1990s rather than a current/trendy musical. No clue who the couple was but the production was so-so. Valentina who played Angel, couldn’t sing or dance to save her life. Vanessa Hudgens (Maureen) was terrifi c. Jordan Fisher (Marc) was also very good. The actor who broke his leg had a great singing voice and I would have loved to see this really be a LIVE production and not just a taped dress rehearsal. The BEST part was the final scene where the original Broadway cast members joined the cast on stage to sing Seasons of Love. Jordan Fisher and Kiersey Clemons?